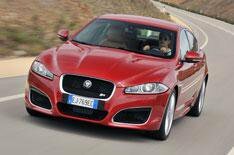 Jaguar XF-R driven | What Car? Jaguar's executive car gets a face-lift, and we drive the range-topping XF-R.
Of greatest relevance to business users is the introduction of the fuel-efficient, four cylinder 2.2-litre diesel engine with its new eight speed automatic gearbox. We'll drive that particular engine next month. Until then we've had a spin in the range topping 2012 XF-R. The most obvious revision to the XF range is the front of the car. A new bonnet with a wider power bulge, slimmer headlights featuring daytime running LED lights and a remodeled front bumper give the car a sleeker look. The XF-R takes things even further with two large air louvres punched into the bonnet, and a deep front bumper featuring three large vents. Sill extensions and new style 20-inch alloys complete the look. The XF-R's interior has also been given a makeover, with new trim, more comfortable seats and a restyled steering wheel. All add extra quality to the style that comes from the familiar rising gear selector and revolving air-vents. What hasn't changed is the XF-R's lust for speed. The 503bhp 5.0-litre supercharged V8 engine is still mated to the six-speed automatic gearbox, but it produces so much torque it could probably make do with just three gears. Give it full throttle and the XF-R will scorch to 60mph 4.7 secs. Few, if any, manufacturers are making cars with a better balance of taut handling and comfort than Jaguar. Although the R's suspension has a firm edge around town, it's supple and controlled in bends and sits securely on the motorway.